he watched himself in the windows all day. He took me up with him once. "Life is balance," he said. "You learn quickly what life means up here." glass eight hours and replacing panes. the world was ugly, and the wind caught him. cleansing air beneath outstretched wings. a long time to think. where little souls came to pray. into the gaps between the rocks. as if that alone proved your love for me. you knew I’d follow you anywhere. standing on the sandy shore. Copyright 2009, Ralph Scherder. © This work is protected under the U.S. copyright laws. It may not be reproduced, reprinted, reused, or altered without the expressed written permission of the author. 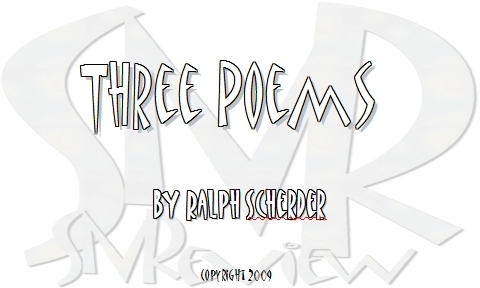 Ralph Scherder began writing at the age of 13 in an attempt to impress young women. Well, it didn't work out as planned, but he kept writing anyway. Since then his fiction and poetry have appeared in numerous magazines, and his first book, The Taxidermist's Son, was released in October 2005 by Rock Spring Press. He lives and writes in Herman, PA.